There’s something charming about a game that’s not very good, but also not that bad. My Time At Portia falls in that category for me. It’s a bit like Stardew Valley, except in 3D, focused more on crafting things than farming, and also not as good. There’s some passable music, some nice scenery, cute character design and writing that is neither awe-inspiring nor distracting. I’ve earmarked some characters I want to date, though I don’t feel the same obsessive pull that I got from Stardew. It is the video game equivalent of listening to the Top 40 station on a long drive. Sometimes, it can be genuinely fun. Other times it’s a slog. After you turn it off, you’re not really sure how you listened to it for that long, but you know you’ll be doing it again soon. 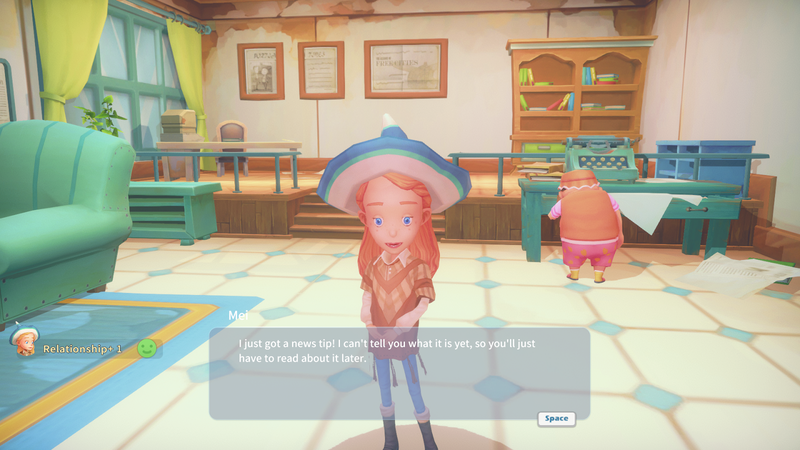 Everything in My Time At Portia is polished enough to be mildly enjoyable, but not so polished I feel driven to play it. It fits neatly into a genre of games I enjoy where you date people and craft things in a rural town, but does not do much to innovate on that system. It’s a game that seems to be content being exactly what it is, and I admire its devotion to those tropes. Every time a character shows up, like the farmer across the street, or the rough-around-the-edges officer who gives you your first crafting mission, I know exactly what their personality will be. She’s generous, with a mild personality. He’s blunt, but has hidden depths. The familiarity is comforting. This is why people like sitcoms or procedurals. A sitcom or a procedural can be truly great, but a lot of them are just fine. They go through all the same motions as every other show in the genre, with characters that are indistinguishable from one show to the next. Those same old plot points and story beats feel like a refuge when you’re too tired to make dinner. There are no surprises here. You already know exactly what’s going to happen. Not every game has to be a masterpiece, just like not every movie has to be a serious, character-driven drama. There are times when I just want to throw on an average Star Trek flick cause I have laundry to fold. Games that are just okay can also be a good, semi-passive background activity while you’ve got something in the oven. It’s good to take some time to appreciate all the multifaceted aspects of life—even the things that are mediocre.